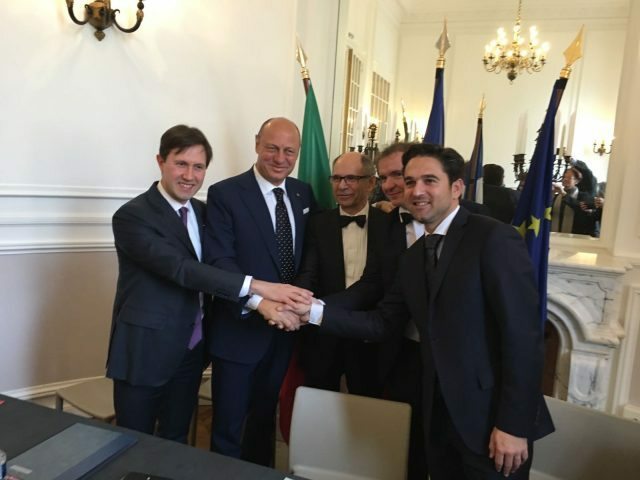 Chianti Classico and Champagne have signed a partnership agreement that is set to boost the promotion and protection of winemaking and wine tourism across the two regions. The new partnership deal, which was signed by the majors of Reims Arnaud Robinet and Florence Dario Nardella on Friday (16 December) has been designed to allow the two wine regions to share experiences and best practise on a number of practical and promotional issues. These include legal protection of the respective designations of origin and corresponding collective brands, governance policies for their respective designations of origin, and the exchange of wine-making experiences, looking especially at sustainable development and climatic changes, as well as policies for tourism development. Sergio Zingarelli, Chairman of the Consorzio Vino Chianti Classico thanked the Presidents of the Comité Champagne, Maxime Toubart and Jean-Marie Barillère for establishing the partnership, pointing out the shared outlook and values of the two wine-growing regions. “With the signing of this agreement of cooperation, we are bringing to life a partnership which will include sharing our experiences in managing our respective governances, legally protecting the designations of origin in non-EU countries, in tourism development policies, and in promoting our heritage,” he said. He noted the centuries of traditions that had been developed and protected over time. It marks a step up in the collaboration of the two towns, which were first twinned in 1954, and has already resulted in cultural, economic and sporting exchanges and projects, it said. Earlier this year Chianti Classico celebrated its 300th anniversary. Two years ago, the region introduced a new top-tier level of wines, ‘Gran Selezione’, positioned at the top of the region’s DOCG in terms of quality, ahead of Chianti Classico Riserva and the Chianti Classico Annata, which marked the first time wine legislation in Italy has permitted the introduction of a new category at the top of a denomination.